I was very pleased that we were able to have searchers in the field almost without interruption for over three key weeks in February and March. Erik was in the area alone from February 28-March 6, and conditions were good enough for him to get out for part of almost every day. At present, Matt Courtman is still in the field. I will be posting my trip report within the next few days; it covers the afternoon of March 7 through the morning of the 16th. There have been no possible encounters during this period, a stark contrast with this time last year. I’ll be addressing this in my report, but in the meantime, here’s Erik’s. It was a pleasure to read. I’ve made a couple of side comments in italics. Back in the early 2000’s, I often used the holiday break as a time to take off from work and go birding someplace I’d never been before. Following the Ivorybill rediscovery announcement in May 2005, I decided to go to Arkansas “on a lark” and at least see the habitat where the bird had been found. There would be birding opportunities – a chance to see wintering species not present at my home in Montana, and I wanted to visit Little Rock High School National Historic Site. After several days of birding, I saw the ivorybill. Like many other sightings, it was a brief look, but I saw the bird through binoculars, sharply focused, in good light. I made 4 more trips to Arkansas and Florida in the next two years, before my job took me to Alaska for 8 years. I made no more trips to the southeastern United States in that time. But retirement in March of 2017 allowed me time to think about a return; and Mark graciously responded to my inquiry with an invitation to join his search effort in December 2017 / January 2018. I got to accompany him and Steve Pagans again in February; and Mark had another search planned for March, but the timing and logistics didn’t quite work out. With trepidation, I asked about searching the week before the main search effort, and Mark was encouraging. I’d seen how well Mark navigated the woods he knows so well, and Steve was equally competent (Steve is considerably more competent) – and always had his GPS available to ensure we could get out of the woods. But on my two initial trips; I often did not know where we were headed and often got turned around. I didn’t say so, but I knew I’d have to get a lot better at reading my GPS. Mark also encouraged me to purchase a dedicated audio recorder, in case I heard double knocks or kent calls as other searchers have in the past. This was perhaps the most obvious advantage to being in the woods in March: the likelihood that ivorybills would be more vocal and/or more noticeable if they engaged in courtship, cavity construction, brooding and interaction at a cavity, or feeding of nestlings/fledglings. If I could be in the woods a week before Mark’s major search effort, then at least I was providing some additional coverage for a possible encounter. A friend of mine said with encouragement “I’m sure you’ll see it this time!” I didn’t respond that “I don’t think so…”. Of course I’m optimistic, but my primary goal in the field is to contribute quality hours to searching for a species which has a very low encounter rate. The more hours searchers rack up, the more encounters we have. It’s important to me to contribute by adding up those good hours. Logistics are a major part of the search effort: traveling from my home in Colorado; arranging airflight, rental car and lodging. Being prepared with the right clothing, rain gear, hat, camera, GPS, audio recorder, first aid kit, and all the miscellaneous supplies carried each day. I studied maps so that I wouldn’t be as lost as I was on my first trips. I could check online for the weather forecast and sunrise/sunset times. And then on my travel day, it takes about 12 hours from my house to my destination. I pick up lunch supplies at a local supermarket, and get ready for 7 days of searching. It’s exciting first thing in the morning – arriving at the start point, and getting everything ready to walk into the woods. I only forgot to record the location of my vehicle once – but remembered within a 1/2 mile of my start, and that was close enough to ensure I could get out in the afternoon. I start out listening to and trying to see every bird – they’re all different from the birds back in Colorado, and if I’m standing still trying to pull a Yellow-eyed Vireo out of the shrubs – well, I can be listening for ivorybills at the same time. Much of my time in the bottomland forests, I’m simply acting as a roving Audio Recording Unit. Although I rely on my eyes more than my ears – and at times it seems that I can see a lot of the habitat around me – I know from experience that I can’t really see all that much. Woodpeckers cling to the backside of trunks and branches. Sometimes I watch them up high, and then they move around to the opposite side of a branch – and they’re completely invisible to me. Had I not seen them move to that location, I’d never know they were there. So as I scan the forest around me, I’m aware that there’s really only a limited amount of “space” – of “volume” – that I can peer into to check for birds. My best method for detecting the presence of many (most?) birds, is being able to hear them. So I wander around the forest, always listening, and hoping to hear a bird that may not vocalize very often. I know from experience that I have good hearing, in the sense that I can detect very low levels of sound; often I can hear levels of sound lower in volume than my birding companions (but, sometimes others hear sounds that I miss). However, I’ve also learned that I don’t have a “discriminating” ear, and I easily confuse all kinds of species: Pileated Woodpecker sounds a lot like Northern Flicker; Northern Cardinal sounds a lot like Carolina Wren; Tufted Titmouse can sound like Carolina Chickadee. It always makes sense to me when someone tells me what I’m hearing, and often – given enough time (if the bird continues to call) – I can figure it out. But I know I’m not as good at identifying birds by sound as I am by sight. I’m pretty good at identifying birds in the field and in photographs. Often, I only need a few pixels to correctly identify a bird. I make my share of mistakes, and often call out the name of a bird before I’ve completely processed all the information – and my initial identification (part of the thought process for arriving at a final ID) is incorrect. But while I make lots of mistakes while trying to arrive at the conclusive ID for a bird, I’ve got to be certain in the end. Entire books have been written on this topic – and that makes sense to me. Searching for ivorybills is very different (for me) from “birding”. Birding is a fun, enjoyable activity that I do regularly, in all kinds of habitats, with lots and lots of opportunities to see and identify birds. Searching for ivorybills is mostly just putting in hours without seeing or hearing anything. But my approach to searching is to go “birding” and enjoy the birds I see, and to be aware of the environs around me as I’m looking for or looking at, birds. I stop and pause for several minutes at a time. I’m not in any hurry – I don’t have to be anywhere else. I think about all the other recent encounters that have been described: someone in the right habitat, often engaged in an activity other than searching – and while relaxing, or while sitting down, or while engaged in something other that “actively looking”, suddenly they become aware of a bird that they focus on, and it turns out to be an ivorybill. I think about lots of things written about ivorybills, things that I can remember and things that I’ve heard other searchers and other birders talk about. And… I wander around the bottomland forest – listening and looking. I looked for scaled bark, trying to pay attention to the details Mark has taught me in the field. As a long time reader of the Project Coyote blog, I read many of Mark’s descriptions of scaling, and looked at his photographs. But having him explain scaling in the field, spending several minutes at a tree with fresh scaling, increased my understanding by at least two orders of magnitude. Mark brought to life the importance of scaling as evidence for ivorybills occupying or using the area. But I also learned that Mark has an eye for “seeing” scaling, and in my previous trips I never spotted “good” scaling before Mark did. (It’s just a matter of practice.) On this trip, I did see some tree top scaling in a sweet gum, and I saw a few downed logs (recently downed) with scaling that might have been done by ivorybills (but which also could have been done by other species). I was conscious that I tried harder looking for scaling at some times, and less hard at other times – it’s a skill that needs to be learned, and I’m still at the bottom of the learning curve. I saw many Pileated Woodpeckers over the week, and on the first day, I noted that I saw 4 pileateds while I was standing in one spot, more or less simultaneously. Great Blue Herons (and other species) always seemed to be aware of me, when I was walking (even walking slowly/quietly), long before I was aware of them. By contrast, when I was standing or sitting still (especially when in a shadow, but even when in the sun), birds and other animals would sometimes approach quite close, and go on about whatever they were doing, clearly not yet aware that I was present. And sometimes, even once they became aware I was present, their behavior was still reserved and they lingered at closer range than the birds (or pigs, or deer, etc.) that became aware of me as I was walking. Some observations under the latter conditions come to mind: (1) After a large limb broke off from a tree, crashing to the ground with an impressive disruption of the quiet, two pileateds flew to a cypress tree near where I was standing quietly. The first pileated flew to the top of the cypress and drummed a couple of times. The second pileated flew to the trunk of the cypress to investigate one of two cavities, one right above the other. The pileated stuck its bill and just a bit of its head into the cavity when suddenly a gray squirrel exploded from the cavity, driving the pileated away. The squirrel clung to the cypress just a foot or so from the cavity, chattering loudly for a few seconds before retreating back into the cavity. (2) I was sitting with my back against a birch tree, watching a fresh, asymmetrical (but small) cavity in a cypress tree across a creek (mostly taking a break in the heat of the afternoon), when a Hermit Thrush approached from a nearby shrub. The thrush moved closer (to within perhaps 15′), then off to my right, and then back in front of me, before finally moving slowly off and out of view. (3) Eating lunch on a log one day, a Yellow-bellied Sapsucker suddenly appeared in my peripheral vision, seeming to fly right at my head, before veering off at the last second to perch on a large trunk about 12′ from me. I’d been sitting quietly (the bird might have thought I was a stump? ), but seemed to recognize I was not part of the landscape when it veered off to perch and start tending its sap wells. I was able to grab my camera and take a couple photos while it was at close range, the bird never flushing as when they are startled, but rather simply moving gradually higher up the tree and out of view. A couple of random thoughts based on my field notes: I flushed wood ducks about 3 or 4 times, and always thought it would be impossible to confuse a Wood Duck for an ivorybill. Even one time when I noted that “the ID was a little tricky”; the situation was that I wondered for a split second “what was that?”, and not “could that have been an ivorybill?”. I observed two (rather small, I think) Cottonmouths; both were well behaved and non-aggressive. Very beautiful snakes. And one other observation: while standing quietly in a shadow, I saw a large bird, darkish in color, mostly obsucred by a tangle of vines, fly in to a log on the ground. I could not see the bird, and thought it was on the opposite side of the log from me, and there was much undergrowth that made visibility difficult. I heard several loud (very loud) raps, interpaced with quiet, and based on my time in the woods, I thought pretty sure this was a large woodpecker, foraging on a downed log, and occasionly delivering 3 to 6 heavy blows to the wood. The bird continued foraging in this manner, with several sequences of loud knocks, and I finally decided to move to my left to try to get a better angle on the log. I heard another couple sequences of raps and then quiet, and I was pleased I hadn’t started the bird and caused it to flush. I moved to my left, and a little closer to the log, and then there was a downed tree blocking my path, and some water, and I had to make some noise to get around the obstacle, and continue moving to try to see the area around the downed log better. By this time, it was clear that I had flushed the bird, and did not see or hear it any more. I’ve thought about this event, and it emphasizes to me that birds may often be close enough to see, but impossible to see because of vegetatation blocking the view, and that birds we often think of being “in the shrubs” or higher “in the trees” are often on or near the ground. If I had to guess, the bird was either a Pileated Woodpecker or a Northern Flicker. I’ll never know. I started writing this note with the intention of providing a simple summary of my observations during the week I was in Louisiana, but quickly realized I was describing a more general sense of purpose and the idea that looking for ivorybills is distinctly different from looking for other birds. I could add some good search hours to the effort – that was worthwhile and enjoyable to me, and although I’m uncertain how my hours contribute to the Project Coyote overall effort, I am very pleased to be part of the team. photos follow . . .
First morning: Wolf Spider, possibly Tigrosa helluo. Cottonmouth (fairly small, less than 2′ long; it saw me before I saw it). A slug on a branch where I suspended my backpack for a morning break. I suspect this otherwise healthy looking tree has some parasite or other infectious agent causing blisters in the bark. I looked for large, asymmetric cavities; these are probably too small (but it’s difficult to judge size; the cavities were often 80′ or higher above ground). Recent rains had swollen water bodies and washed leaf litter and other debris off the forest floor; and made even very shallow ditches treacherously slippery. And… it was difficult to find places to cross small streams and sloughs. Raccoon prints in the mud. Recently dead trees are of interest because they may attract woodpeckers; and a very large, powerful woodpecker might be indicated if tightly held bark is stripped away in large flakes, a feat difficult for smaller woodpeckers to perform. I’ve included several photos of logs used to cross deep water; as an indication of how it’s difficult to move efficiently through the forest. What’s not seen, is how far I had to walk to find a suitable log to cross, and all the logs I rejected. I believe all these are Red-eared Sliders. These appear to be twigs stripped of bark and left on the bank; either because I startled a beaver, or because whatever animal was accumulating these was waiting for a future time to retrieve the wood. For whatever reason, I seem to notice scaling on fallen trees more than on trunks and/or limbs overhead; this appeared to be a fairly recently felled tree, with bark scaling. The other side of the tree trunk above. And at the end of the fallen tree, was this “tall stump” that also appeared recently damaged, and with recent bark scaling. 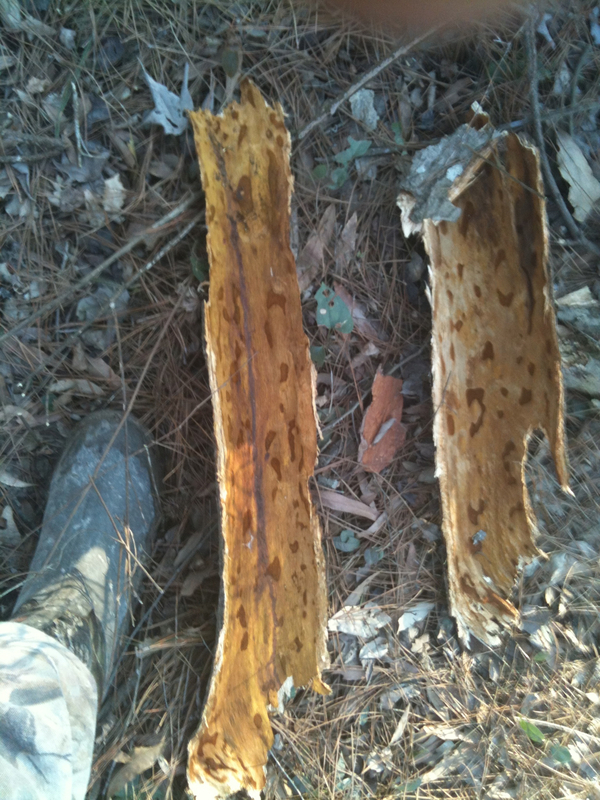 Examining the scaling closely, I think I see where the tip of a woodpecker’s bill has struck a dead blow into the wood. It took me several minutes to clear the flotsam off this tree so that I could cross it. Another tree crossed the same afternoon. And another crossed that afternoon (it was my longest haul out of the woods). … like the eye of a needle. The most common woodpecker I saw was Yellow-bellied Sapsucker. It was useful to try to photograph bird species, to practice that skill, just in case (the majority of my bird photos are poor). The stump of this fire-damaged tree completely burned, while the adjacent trees were undamaged. I would spend long minutes, just sitting or standing and watching open areas; hoping to re-create the situation described by other observers of ivorybills. Cavity that is not too large, and not too asymmetrical. This photo re-creates where my hand was about to grab onto a Devil’s Walking Stick just before I saw the thorns. I was about to descend a muddy/slippery shallow ditch – this is the only Devil’s Walking Stick I saw during the week. Another fire-damaged tree, loblolly pine (I think); again without fire spreading to any adjacent trees. Large, asymmetric cavity photographed maybe 200′ distant and across a water body. Another cavity photographed at a distance. And one more cavity; it seemed larger to me in the field, but this photograph makes it look small and symmetrical. I had to walk a long way to find this log to cross, and the photograph doesn’t show, but it was a bit of a scramble from the end of the log up onto the bank. A series of 3 (older) symmetric cavities in a cypress, with a fresh (irregular) cavity above. I watched the upper cavity for 1/2 hour or more, never seeing anything go in or out. There are lots of challenges in walking about the forest besides water crossings; briers, tangles, thickets, holes to step in, mud, spider webs, fallen logs; forgetting to mark my vehicle on my GPS in the morning; GPS batteries run down, etc. The logs were easy to photograph and maybe give a sense of the challenges.